Mud Pie Marble Wood Serving Board 3 Tier Shelf Buffet Stand Party Server New. Serving a buffet has never been easier! 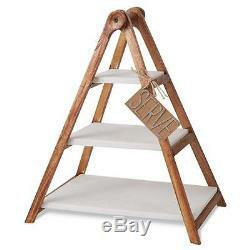 This wood frame stand makes serving breads, pastries, lunch meat and more! The stand is easily assembled to fit the 3 marble shelves in each tier and it's ready for your guests to arrive! Stand is 19" tall, small shelf is 5" x 5.25", medium shelf is 7" x 9.25" and large shelf is 9" x 14.5. You'll be thinking up all kinds of ways to use this stand once you see how beautiful it looks, yet is easy to use! We carry a HUGE s. View our other items for more from this collection. Should you need this service, please let me know. Inquire with the items you are interested in and your zip code or country. I will gladly provide you with a quote. The holidays are: January 1 - New Year's Day, 3rd Monday in January - Martin Luther King Jr's Birthday, 3rd Monday in February - Washington's Birthday (President's Day), Last Monday in May- Memorial Day, July 4 - Independence Day, 1st Monday in September- Labor Day, 2nd Monday in October- Columbus Day, November 11 - Veterans Day, 4th Thursday in November - Thanksgiving Day, December 25 - Christmas Day. Sales are "as is" on previously owned items. Should I make errors in my listings concerning condition, please let me know. Your satisfaction is my #1 priority. HEAR WHAT OUR CUSTOMERS SAY. I have a couple outside cats that I feed, otherwise we are a smoke free and pet free home. See my about me page for more details. I live on the East Coast, so please remember I could be several hours ahead or behind your timezone. Get Images that Make Supersized Seem Small. The item "Mud Pie Marble Wood Serving Board 3 Tier Shelf Buffet Stand Party Server New" is in sale since Thursday, February 16, 2017. This item is in the category "Home & Garden\Holiday & Seasonal Décor\Christmas & Winter\Table Décor & Serving Pieces". The seller is "great*finds*from*kristin" and is located in Hammonton, New Jersey.